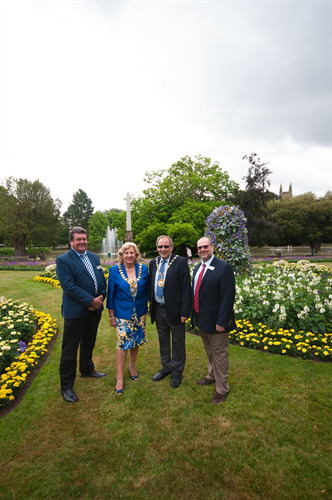 Royal Leamington Spa enters the Heart of England in Bloom Competition annually. The Project is overseen by a Committee of volunteers. If you would like to get involved with any of our projects get in touch with us - we are sure to be able to find a role for you. The Committee is now actively organising the 2017 Competition. This includes the preparations with our Primary Schools resulting in the geranium train at Jephson Gardens and work in association with a wide variety of partners across the Town to portray Leamington in all its glory when we are judged by the HEIB Judging panel on 11th July . in 2017, Leamington was awarded a GOLD certificate in the small city category in the Heart of England in Bloom Competition.Help us to achieve another "Gold" award by entering your Garden into this year's domestic garden competition. Our Competitions for 2017 are now closed. Keep up to date with all that is happening and re-visit us soon! Leamington was visted by the Heart of Engalnd In Bloom Judges on 11th July when a tour of the Town took place taking in the retail heart of the Town, Lillington Youth Centre, the water distribution plant at Cubbington, Milverton School, Victoria Park and culminating in a tour of Jephson Gardens. We await the announcement5 of the result in September.